I could of used this in Bolivia. Just got back, and numerous signs in spanish were difficult to understand. Well with Word Lens, on the iPhone, an instant translation is completed for you. No more wondering what the sign means. Word Lens app uses advanced translating technology and provides an instant translation. The app is free, the translating capabilities will cost you. Check it out, maybe you can use it. The Tiffen Company, award winning manufacturer of still image and video accessories, announced fourth quarter availability, of the Steadicam Smoothee, the new “easy to use right out of the box” camera stabilizer. The Smoothee, comes with a camera mount, quick start instructions and carry bag. It will sell at retail for $199.99. 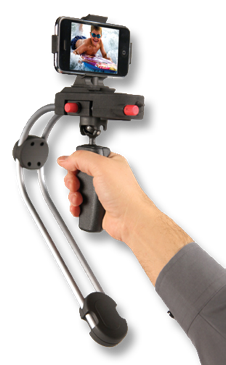 Other Smoothee mounts will be available for the Apple iPhone 4, iPod Touch and FLIP Mino HD with mounts for other video devices to follow. 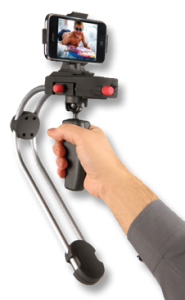 The Smoothee, developed by Steadicam, the leader in camera stabilization , now allows these smart phone and video devices to capture incredible video without the shakes normally associated with hand-held video shot on the go. “The Smoothee has received outstanding reviews, said Hilary Araujo, vice president of marketing for Tiffen. “We’re very proud of this incredible new Steadicam and excited that Tiffen will be able to make it available for consumers, so that anyone can take great videos the very first time,” continued Araujo. The lightweight, agile, and easy to use Steadicam Smoothee features an innovative, patented design built around a durable mono-frame metal structure that requires no complicated instructions to begin using. With its “go anywhere” compact dimensions, The Steadicam Smoothee is approximately 8”W x 14.5” H x 2.5” D (20.3 x 36.8 x 6.4cm) in operating configuration. Each of the individual patented quick release removable camera mounts can also serve as a tabletop stand or can be mounted to any tripod with a standard ¼ x20” camera mount. The comfortable ergonomic Smoothee hand-grip folds up securely when not in use. 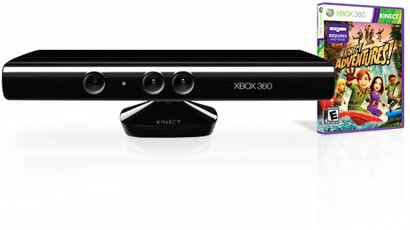 Kinect – Top Selling Tech Toy, with an estimated 100,000 units per day being sold. You are the controller. No gadgets, no gizmos, just you! Kinect brings games and entertainment to life in extraordinary new ways without using a controller. Imagine controlling movies and music with the wave of a hand or the sound of your voice. With Kinect, technology evaporates, letting the natural magic in all of us shine. Controller-free gaming means full body play. Kinect responds to how you move. So if you have to kick, then kick. If you have to jump, then jump. You already know how to play. All you have to do now is to get off the couch. A solar-driven process could yield far more fuel than conventional biomass production. Sundrop Fuels, a startup based in Louisville, CO, says it has developed a cleaner and more efficient way to turn biomass into synthetic fuels by harnessing the intense heat of the sun to vaporize wood and crop waste. Its process can produce twice the amount of gasoline or diesel per ton of biomass compared to conventional biomass gasification systems, the company claims. 2 B or not 2 B – that is your decision! Join us now, get with the plan! The improve plan is now available. Get your ideas in gear! Make your invention work! Be successful with your innovation! 2 B in Action – The Plan(TM) will guide you to success! Make a commitment, 2 B in Action, 2 B a Success, 2 B creative, 2 B an great inventor…it’s up to you. 2 B or not 2 B (in Action) … that is the question! Most of us have periods of inaction, often called procrastination, where our ideas, inventions, and innovation slow. If we let “inActive” take charge of any area in our life, it typically ends up affecting all areas. Whether it’s a Role you play or a Goal you have, you always need to “2 B in Action”. Resetting your Goal for each Role, whether it is in family, fitness, or one of your many business ideas/activities, motivation is key 2 B in Action. I use “2 B in Action” as a driver … focus moves my actions forward. “2 B in Action – the Plan(TM)” is the key to Success in all areas of your life. It is as simple taking action right now, order your Plan. and make your dreams come true. 2 B in Action – the Plan(TM) focuses on developing a quick action plan, achievable, doable and launches you on the track to Success. For example, everyone wants to be fit. “2 B in Action – the Plan(TM)”, would list the next 2 actions to focus on to drive you to fitness, ie take your dog(s) for a walk, do 10 push ups today! I know, everybody tells you to make you “To Do” lists. I have them, but I find I need to link each “To Do” with an activity to be successful. That is why I created “2 B in Action – The Plan(TM)”. That is why I believe that selecting and focusing on the next 2 actions is a much more useful tool. 2 B in Action – the Plan(TM) with a workbook to drive your ideas, will be formally roled out shortly. I want to hear from you, let me know how it works for you. This is cool. We need some of this in Canada. China has begun operating the world’s fastest dedicted rail line: a 968-kilometer line linking Wuhan, in the heart of central China, to Guangzhou, on the southeastern coast. The “WuGuang” line trains (locally built variants of Japan’s Shinkansen and Germany’s InterCity Express high-speed trains) raced along at up to 394 kilometers per hour (or 245 miles per hour). 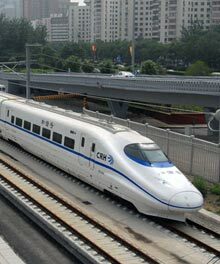 They have also recorded an average speed of 312 kph in nonstop runs four times daily since the WuGuang’s December 26 launch, slashing travel time from Wuhan to Guangzhou from 10.5 hours to less than three. 3D TV is being billed as a possible saviour for recession hit manufacturers looking to boost sales. On the opening day of the Consumer Electronics Show, CES, in Las Vegas, all the big names unveiled 3D TV’s. Industry experts said the picture looks promising with a survey showing around 3.4m 3D TV sets will be sold in the US this year. “It’s a challenging market. We need something to kick us out of this,” said Panasonic’s Elsuke Tsuyuzaki. “To me, the thing that’s going to get us there is 3D,” added the firm’s chief technology officer. “2009 is a year none of us want to repeat,” said Gary Shapiro the president of the Consumer Electronics Association (CEA) which hosts the annual tech gathering. EmTech India 2010will be held March 8-9th, is a two-day summit exploring next-generation technologies and their impact on business and society. The event will attract top decision makers from the technology, engineering, investment and management communities from around the world. The event will also feature the first ever India TR35 list and awards ceremony, which recognizes the 35 top innovators under the age of 35.